Entering King Solomonâ€™s Temple from the eastern gateway, one would immediately notice the two huge freestanding columns, freestanding as these columns did not support a roof or overhead structure. Different views have been expressed as to the actual purpose of the columns, whether they were pillars, obelisks, fire altars, incense stands, or â€œtrees of life.â€ Popular opinion among most scholars is that these columns, because of their tremendous size, the names given them, and the elaborate capitals placed on top of each, are not of an architectural necessity but purely decorative or symbolic in nature. The columns were hollow bronze castings with a wall thickness equivalent to four fingers thick and having a 6â€™ 10" diameter, 30â€™ 8" height, and capitals 8â€™ 6" tall. The capitals or decorative tops placed upon the shafts were also made of bronze. They were prepared with images of pomegranates, covered network and wreaths, giving the capitals the appearance of imitating the shape of the seed vessel of the lotus or Egyptian lily, a sacred symbol to the Hindus and Egyptians. The column to the left was named Boaz. On this column was etched in Hebrew the phrase â€œMay the Lord establish the throne of David and his Kingdom for his seed forever.â€ The column to the right was named Jachin, and its inscription read â€œIn the strength of the Lord shall the king rejoice.â€ Entered Apprentices stowed their working tools within the column Jachin. 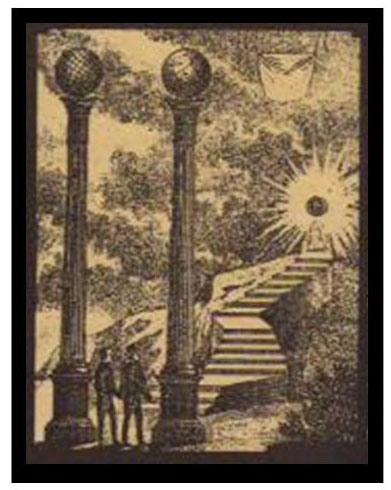 In turn, Masonry has traditionally set globes upon the tops of the two columns: the celestial globe, symbolic of the spiritual part of our composite nature, and the terrestrial globe, symbolic of our material part. If a Mason is learned in Kabalah (an ancient Jewish mystical tradition), he may delve into more complex symbolism whereby each column or globe represents, among other things, wisdom and understanding, the active and passive principles, positive and negative. This is a complex and advanced level of esoteric thought which usually takes a lifetime of study to comprehend fully. The two columns are probably the most familiar fixture of King Solomonâ€™s Temple to Freemasons and nearly as familiar a Masonic symbol as the Square and Compasses. As all Masonic Temples are symbolic representations of King Solomonâ€™s Temple, the columns are our closest physical link to the original structure.